"Banber Matenadarani" (Herald of the Matenadaran), N 25, Institute of Ancient Manuscripts named after Mesrop Mashtots. "Nairi" publishing house, 2018. The jubilee 25th volume of the scientific periodical “Banber Matenadarani” has been published. 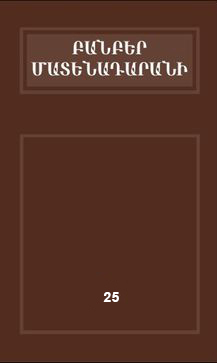 This volume of the “Banber Matenadarani” includes International Conferences’selection of articles on the “Readings of Narekatsi” 3rd (October 17, 2017) and the “Pearl of Printing” (September 19, 2017), as well as articles and publications devoted to various issues of history, philology, art history and medieval science. The publication of the 25th volume of "Banber Matenadarani" was supported by “JTI ARMENIA” CJSC. See the digital version of the 25th volume of the “Banber Matenadarani” here.